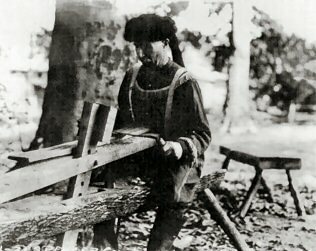 The above photo from the National Archives shows a man using a draw knife to shape a piece of wood. He is wearing a raccoon skin hat. In the background is one of the large beech trees that was prevalent in the park. Negative 6637-C. Thanks to Patricia Dawson for her research. Also, thanks to the South Spencer High School Electronic Office class for keying many of these documents. 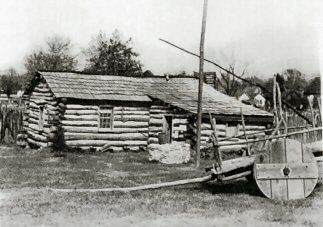 This photo is of Brown's Tavern. Notice the wooden wheeled cart in the foreground. This photo is of the Old Pigeon Baptist Church. Notice the clothing styles of the 30's. 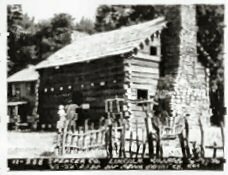 The caption under the photo reads: Spencer Co. Lincoln Village 6-9-36, Old Pigeon Baptist Church. 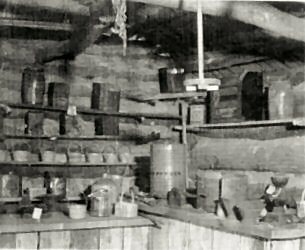 This is an inside view of the Jones' Store. Wicker baskets and crockery are on the shelves. The large container in the center has GUNPOWDER written on it. In the upper left corner of the photo, hanging in the rafters are bamboo courting tubes. This view of the Village is looking southwest from the current location of the Mackey Cabin which was moved to this new location when it was rebuilt. 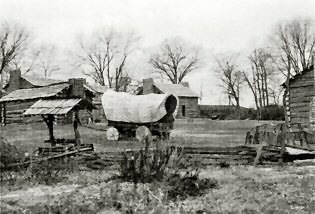 The covered wagon is on the site of the Transportation Building which was constructed during the filming of The Kentuckian.